These cartoons illustrate the growing hostility toward the practices of the big businesses that fueled the industrial development of the United States. In "The Protectors of Our Industries" (1883), railroad magnates Jay Gould and Cornelius Vanderbilt, department store tycoon Marshall Field, and financier Russell Sage are buoyed from the rising tide of "hard times" on the backs of workers, whose low wages are on display. "Next!" 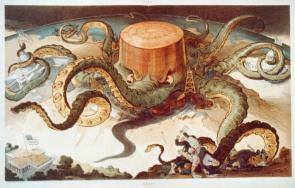 (1904) represents Standard Oil as an octopus, wrapping its tentacles around the United States Capitol, a "State House," and the White House. Cartoons like these helped inspire reformers to limit corporations’ control over American politics and society. In the West, anti-corporate sentiment contributed to the Democratic Party’s nomination of Nebraska’s William Jennings Bryan for the presidency in 1896. Read the document introduction, examine the two images, and apply your knowledge of American history in order to answer the questions that follow. Create a chart with four columns representing the four “Captains of Industry”: Jay Gould, Marshall Field, Cornelius Vanderbilt, and Russell Sage. For each, list their businesses, treatment of employees, and attitude toward government oversight. To what extent do both cartoons indicate the artists’ concern for workers? How effective was it for the artists to depict Standard Oil as an octopus and title the other cartoon “The Protectors of Our Industries”?